Uncle Ben’s oft-quoted phrase leapt off the pages of Spider-verse to reverberate inside my head as I hit the open road, nestled in the cockpit of a 3.9-litre twin-turbocharged V8 mean machine with the power to hit 0-60mph in three seconds. In simpler words, the Ferrari 488 Spider GTB was living up to its supercharged reputation as it roared down the highway, drawing on its amplified 661 horsepower to eat up the miles en route to Ras Al Khaimah. 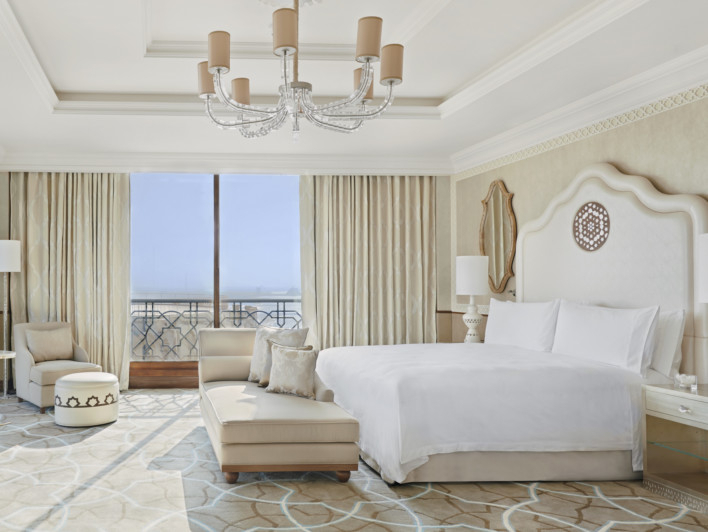 Waldorf Astoria Ras Al Khaimah’s Junior Suite Bedroom. The shiny red Ferrari was on loan as part of the Waldorf Astoria Ras Al Khaimah’s tailor-made Supercar Experience, which offers guests the opportunity to supercharge their stay in the Northern Emirate with a high-powered, fuel-injected ride that literally puts you in the driving seat. Teaming up with Unique Mobility Services, the bespoke holiday allows visitors to get behind the wheel of their chosen supercar, including a Lamborghini Huracan and a Porsche 911S, where they dip their toes into a thrilling joyride that culminates in a luxury stay at the Waldorf Astoria RAK. The UAE’s love of fast cars is hardly a hidden fact, what with every major Hollywood production hitting full throttle ever since ‘Mission: Impossible — Ghost Protocol’ and ‘Fast & Furious 7’ shifted gears to shoot adrenalin-charged sequences here. The country’s elite police force is also not immune to the need for speed with a supercar fleet of vehicles that sees the Dubai Police steer a Bugatti Veyron, an Aston Martin One-77, a Bentley Continental GT, Porsche Panameras and BMW i8s. Meanwhile, the counterparts in Abu Dhabi drive their own range to include the Lykan HyperSport and a Lamborghini Aventador. It comes as no surprise then that a supercar holiday would be in the works in Ras Al Khaimah, which is positioning itself as the adventure capital of the UAE. The Supercar Experience can be booked through the hotel’s concierge service, with options of having the car delivered to your doorstep or having it brought you upon check-in at Ras Al Khaimah. The concierge can also offer route options within the emirate, including a picturesque drive up the Jebal Jais peak that leads up to the world’s longest zip line, which is now fully functioning again after the facility had temporarily closed following a helicopter crash on the mountain that killed four crew members on December 30. Needless to say, renting a supercar comes at a hefty price and the deposit alone for a single day rental can set you back Dh10,000. The deposit goes toward paying for the speeding fines that renters almost always accumulate, stated the representative as she handed over the key to the Ferrari. Reliving THAT scene as the Fast & Furious crew walk down the front steps of the Emirates Palace to the convoy of super-luxurious sports cars, I hopped into the driver’s seat, eating up the miles as the car headed northbound on the freeway to RAK. With each passing minute the scenery changed, making way for the rolling gold-red sand dunes that signalled the destination was almost upon us. The towering Waldorf Astoria complex holds pride of place in Al Hamra Village next to an 18-hole championship golf course, with a 350-metre beachfront that gives unparalleled views of the Arabian Gulf. The 346-key resort is decorated in ivory hues, with just a touch of azure and browns to give off a Greek-island vibe. For the stay, we were ushered into a King Junior Suite, with breathtaking views of the sea from its private balcony. The room itself comes with a lounge area, an I-docking station and a coffee machine. Aside from a luxurious king bed, there is also a separate dressing room, along with a marble bathroom with a soaking tub and separate rain shower. Taking in the plush surroundings for some R&R, we soon found our way down to sample one of the nine restaurants across the property. Choices are aplenty, with the trendy Japanese restaurant UMI, with a Teppanyaki grill and a sushi bar, to the Peacock Alley serving up a range of afternoon tea experiences. Our evening took us through the doors of the Lexington Grill, boasting a theme taken from US steakhouses and the famed street in New York. With a menu of steaks and seafood flown in from around the world, Chef Eric Turgeon also serves up his unique air-dried beef cuts. For those who are less inclined towards a carnivore tendency will find several vegetarian options on the menu as well. Those of you who have booked in a weekend stay can also try the Iranian restaurant, Fayrouz, or experience private dining at Marjan. While time did not permit, the Waldorf Astoria Spa with a flotation bed, a VIP couple’s treatment room and a signature herbal sauna adds to the overall experience. Unfortunately for us, the supercar needed to pose for its photo ops for the feature, and with strangers, before heading back down the highway to return to Dubai. For those feeling more adventurous can take a two-day road trip and accelerate up Jebal Jais where temperatures of late have dropped down to the single digits. Waldorf Astoria Ras Al Khaimah is offering the adrenaline-fuelled packages that allows guests to choose between a Ferrari 488 Spider, Lamborghini Huracan or Porsche 911S. Drivers can opt to hit the road for a choice of 2, 3 or 4 days with various driving distances ranging from 600km to 1,200km available. Bookings can be made through the hotel concierge. Price available upon request.